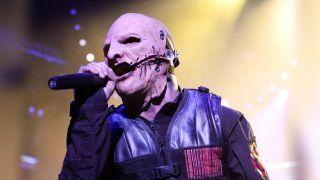 Slipknot frontman Corey Taylor wrote recent single Killpop to express his love-hate relationship with life as a musician, he’s revealed. The track appears on last year’s album .5: The Gray Chapter, which marked the band’s return to studio work following the death of bassist Paul Gray in 2010. And the vocalist is impressed with the different interpretations the song has received. Taylor tells WGRD: “It’s nowhere near what I wrote about. The song is my reflection on my relationship with music – that’s who the ‘she’ is. Not just music, but the music industry. Slipknot are currently touring the US before headlining the Download festival at Donington on June 12-14. They hit the road again in North America in July alongside Lamb Of God, Bullet For My Valentine and Motionless In White. Taylor’s other band Stone Sour release their covers EP Meanwhile In Burbank… digitally today.